Ashen hillsides that were burned in burned in the Thomas Fire take on a nearly winter-like appearance near Carpinteria. Ahead of the season's first storm, Santa Barbara County is issuing some mandatory evacuations. Mandatory evacuations have been ordered for several areas of Santa Barbara County affected by recent wildfires -- including the massive Thomas Fire -- ahead of an impending storm expected to cause mudslides and flooding. Other voluntary evacuations have also been ordered. A mandatory evacuation has been issued for unincorporated parts of Santa Barbara County, Montecito, Summerland and Carpinteria including all areas north of Highway 192; East of Cold Springs Road; and west of Highway 150 at the county line. Residents in the areas along Tecolote Canyon, Eagle Canyon, Dos Pueblos Canyon, Gato Canyon, and the Whittier burn areas near Goleta were also ordered to evacuate. All residents should evacuate by noon Monday. An evacuation center will be set up and details made available Monday. 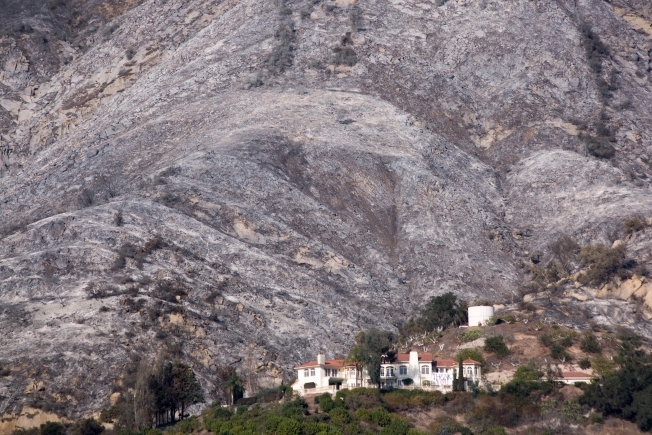 "Flash floods, mud and debris flows can happen with little or no warning. It is important that you understand the seriousness of the situation and follow the direction of authorities," read a statement from Santa Barbara County. An evacuation warning has been issued for areas south of HIghway 192 to the ocean and east of Hot Springs Road/Olive Mill Road to Highway 150 and the county line. Residents in these areas should stay aware of conditions and leave immediately if it becomes dangerous.